When searching for a new bed, you’ll quickly realize there are a variety of mattresses from which to choose. Innerspring, hybrid, memory foam, and latex beds all have their unique benefits. But which one is the right one for you? 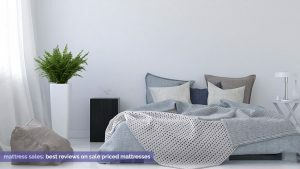 In this article, we’ll be talking about latex beds, their benefits, and how to find the best latex mattress sold today. Did You Find the Best Latex Mattress? All natural latex is sourced from rubber trees, so it’s more eco-friendly than other materials. Because this latex is sourced from trees and does not require harsh chemicals to manufacture, there’s a smaller chance of these beds off-gassing. They’re also resistant to mold and dust mites while being naturally allergen-free. If you are looking for a hypoallergenic or “green” mattress, natural latex is certainly the way to go. Latex mattresses have a “feel” of their own, distinctly different from a bed with a coil system or one made with foam. When you lay down on a latex bed, you’ll feel slight sinking at first as this layer contours to your body but then should begin to feel more “lifted” support. Where traditional memory foam offers a more cradling, “in the bed” feel— latex suspends your body and prevents it from sinking very far. These mattress types are also exceptional at alleviating muscle aches and joint pain because latex reinforces the natural curvature of your body. Because latex is responsive and doesn’t allow you to sink too far, it helps promote your spine’s alignment. Heavier parts of your body, like your hips and shoulders, sink further into the latex than lighter areas of your body, which supports the spine naturally. Lastly, latex is an ultra-breathable material and receives the lowest percentage of heat complaints when compared to other beds. If you’re prone to sleeping hot, latex can help keep you cool at night. It’s also great for couples because it isolates motion well. Though latex beds come with a slew of perks, they do have their downfalls, too. First and foremost, their price. All-natural latex beds are some of the more expensive mattresses you can buy. The high cost comes from natural materials and enhanced strength. It’s important to note, latex is a highly durable material and the average latex mattress has a lifespan of 15 years. Though they may have a hefty price tag, they’re built to ensure your investment will be worthwhile. Plus, there are a handful of mattress sales throughout the year— waiting to buy when the bed is at a discounted price could save you a pretty penny. Another downfall to owning a latex bed is the maintenance that comes with them. Not all latex brands, but a handful of them, recommend periodically flipping or turning your mattress to prevent indentations or premature sagging. Latex is one of the heaviest mattress materials out there, so they aren’t necessarily the easiest to maneuver. If you don’t share your mattress with another person, or feel you’ll have the available help to assist with moving and turning your mattress every so often, this could create an issue for you. Even though latex mattresses have many redeeming qualities, they’re not as commonly found as memory foam, or even hybrid, mattresses. There are three main types of latex: Talalay, Dunlop, and Synthetic. The Editors’ at Sleep Junkie do not recommend choosing a synthetic latex blend. That said, we’ll still touch upon them so you are well-educated on all of your options. Talalay and Dunlop latex are not drastically different from one another, the main distinction between the two types is how they’re manufactured. In regards to feel, Dunlop feels springier than Talalay, which is more bouncy. Below, we’ll explain each type. The Dunlop process is the more efficient way to manufacture latex when compared to its alternative, Talalay. When natural latex is derived from rubber trees it is in liquid form. The Dunlop begins with pouring said liquid latex into a mold. The mold is then sealed up and placed onto a conveyor belt and placed in a vulcanization oven. After the mold has been vulcanized, the latex is removed and thoroughly washed. After the latex has been washed, it’s dried at a high temperature to ensure no moisture is still in the material. Talalay latex is made in a more extensive process, expanding upon the Dunlop method. Similar to Dunlop, this process starts with liquid latex poured into a mold. However, during the Talalay process, liquid latex is only poured into the mold halfway. Once the mold has been partially filled with liquid latex, they use a vacuum to expand the latex until the mold is completely filled. Then, when fully expanded, the mold is frozen. During this freezing process, carbon dioxide is pushed through the latex, causing it to gel. Afterward, the latex is vulcanized, washed, and thoroughly dried. Synthetic latex is created in a lab and made with a mixture of chemicals. Because this material is made almost exclusively with chemicals, it’s not as healthy to sleep on as all natural latex beds. There’s also a much higher chance of experiencing bothersome odors with synthetic latex, as chemicals are what create unpleasant off-gassing. It’s important to note, some latex bedding brands use a combination of natural and synthetic latex, and even some “all natural” latex beds contain up to 30% synthetic latex. Before you buy, make sure to read the fine print and ask questions about the materials of the layers inside. Again, we do not recommend choosing a synthetic latex bed because of the harsh chemicals used to manufacture the material. In the next section, we’ll discuss our Editors’ three recommended latex mattresses to help narrow down your options. When looking at the number of latex beds on the market today, we narrowed our favorites down to three: the Avocado “Green” mattress, the Zenhaven mattress, and the Spindle. 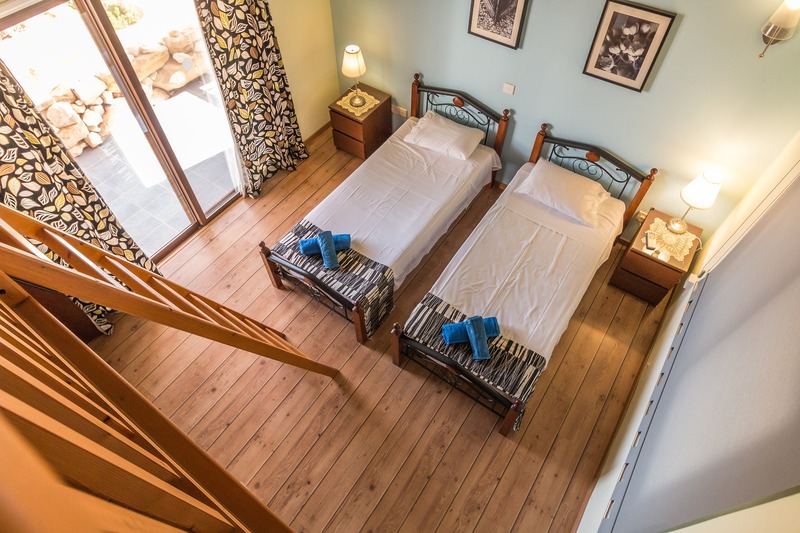 Below, we’ll discuss the different beds and the perks of buying with each company. The Avocado Mattress is a hybrid bed with Dunlop latex and a pocketed coil system. Overall, it’s 11 inches tall, meaning it’s an average height and should fit nicely within most bed frames. 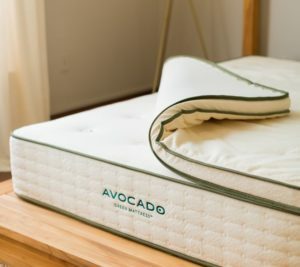 Avocado prides themselves on their eco-friendly business model and healthy beds. They’re GREENGUARD Gold Certified, which means their beds are low in VOCs and safe to use in healthcare facilities. They also use wool and cotton in their beds, both of which are GOTS organic certified. The wool used in this mattress is OEKO-TEX Standard 100 Certified, too. These certifications ensure Avocado is using some of the highest-quality and healthiest materials in their beds. Additionally, they state on their website their beds are completely free from blended and synthetic latexes. For this reason, they earn the spot as our editors’ choice for the overall best latex mattress. The cover of the Avocado Green mattress is their certified organic cotton and wool; this blend feels cozy to the touch. Wool is naturally moisture-wicking, so this cover should move heat away from you while you sleep to keep you cool. The first layer of their mattress is two inches of all-natural Dunlop latex. When you lay down on the Avocado mattress, this layer of latex should contour to your body while offering a more springy feel. As we mentioned earlier, latex is very breathable— Avocado expands upon this by pin-holing their latex, increasing the airflow throughout the mattress. Immediately below the latex layer is the layer of pocketed coils broken into three targeted zones; this material is called Quantum Edge® Elite Combi-Zone®. These zoned pocketed coils provide enhanced targeted support and pressure relief in your shoulders, hips, and back. They also offer a bit of bounce, which reinforces the latex layer above and gives the bed an overall bouncy and responsive feel. The Avocado Green Mattress is available with or without a pillow top. If you choose to add the pillowtop, it adds two inches to the height of the mattress. Overall, they rate their mattress as being medium-firm. Typically when looking for the best mattress for back sleepers, or even stomach sleepers, medium-firm mattresses are comfortable. After you buy the Avocado and it’s delivered free to your doorstep, you have 100 nights to try it out and decide if it’s the best for you. If you do choose to keep it, it’s backed by an extensive 25-year warranty. All in all, a Queen Avocado bed costs you $1,799.00, or $2,199 if you want to add a pillow-top. 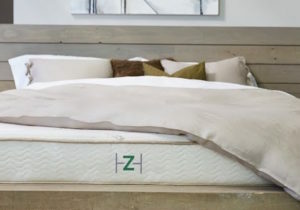 Zenhaven is a subsidiary of one of the most well-known mattress companies out there, Saatva. Saatva sells two other mattresses, an innerspring bed called the Saatva and the Loom & Leaf, a memory foam bed. Unlike Avocado, Zenhaven uses Talalay latex in each of their beds. On their website, they mention their latex is sourced from rubber trees and their beds are free from any synthetic latex blends. The Zenhaven is 10 inches tall and contains four layers, each of which is latex. This bed is unique because it’s flippable— one side is Luxury Plush, which they describe as being a 4-5 out of 10 on the firmness scale, and the other side is Gentle Firm, which they rank as a 7-8. If you’re somebody who’s not so sure if you should sleep on a soft or firm bed, this mattress gives you two sides to try. Below, we’ll break down the layers. The cover of this bed is similar to the Avocado, made from cotton and wool. This blend creates a soft and cozy cover and as we mentioned earlier, wool helps keep you cool by wicking away moisture while you sleep. The first layer of this bed is soft and supportive 100% natural Talalay latex designed to have bouncy responsiveness. When you lie down on this layer, you should feel “lifted” support. Next, is two layers of thick latex. Stacking these two layers together in the middle of the mattress creates a solid and supportive core for the bed. Because this bed is flippable, it does not have a supportive base layer, so the structural support comes from these center layers. Below the core of the mattress is the final layer of this bed, a firmer layer of natural Talalay latex. Because this latex is firmer, it offers more lumbar and spinal support than the first “Luxury Plush” layer. On this layer, you shouldn’t expect to sink too much into the bed. The Zenhaven comes with a 120-night sleep trial and a 20-year warranty. Because the Zenhaven is sold exclusively online, the sleep trial allows you to buy it and try it at home to determine if it’s the best fit. If you decide to return their bed, they do charge a $99 return fee. A perk to buying with the Saatva brand is they offer free white glove delivery and removal of your old mattress. The price of a Queen Zenhaven bed is $2,199, slightly higher than Avocado. Spindle sells one 100% natural mattress, the Spindle. Before, they used to allow you to customize and build your own mattress, and now, they do the hard work for you. Coming in at 9 inches tall, this bed is made with Dunlop latex, organic cotton, and organic wool. It’s available as Soft, Medium, Firm, and Extra Firm. On their website, they recommend choosing the Medium model. Below, we’ll discuss the layers. The cover of this bed is virtually the same as the covers of both the Zenhaven and the Avocado, made with organic cotton and wool. Inside the bed is three layers of Talalay latex, each layer varies in firmness, with the softest layer being on top to act as a cushion to the sleeper, and the firmest layer on the bottom providing structural support for the rest of the mattress. When you buy with Spindle, you have a whole year to try your mattress and decide if it’s the best for you. If you find it to be uncomfortable, you have the option to return it for a full refund or exchange it for a different firmness. Spindle receives great reviews and their customer service team is available to help you choose the best bed for you. After the sleep trial, your Spindle bed is backed by a 10-year limited warranty. With a hefty price of $3,099, we recommend this bed to those looking for a more luxurious latex mattress. 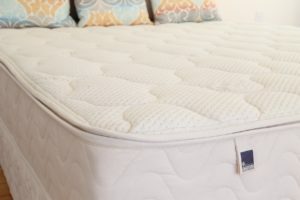 We hope this article has helped you decide whether or not a latex mattress is the best mattress for you. 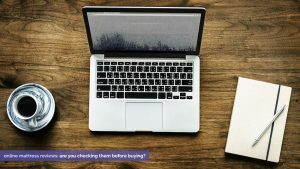 During your search for a new mattress, we encourage you to read mattress reviews and blogs to get honest feedback about different brands and beds. Plus, shop in confidence knowing some of the best brands offer generous sleep-trials.